Caves are plentiful in the Vileno-Sirente Regional Park, and the most interesting one is at Stiffe, near San Demetrio ne' Vestini. 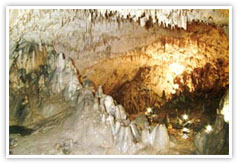 Visitors follow the course of an underground river for about one-third of a mile, with unusual rock formations, gigantic stalactites and stalagmites and subterranean waterfalls. Dramatic natural lighting effects are caused by openings in the cave walls, while subtle artificial lights illuminate lakes, canyons and rapids. The walk ends as beautifully as it begins, when visitors emerge to face the outdoor waterfall that is the underground river's final destination. 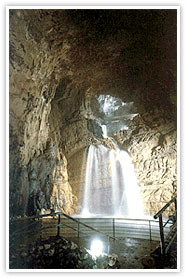 The caves are easily located on the road from L'Aquila to Molina Aterno. Tours depart from 9am to 1pm and from 3pm till sunset, every day in July and August, on week ends in fall and spring (closed Dec-Feb). Groups of 20 or more people can reserve a tour any day of the year. Contact Gruppo Speleologico Aquilano, Svolta della Misericordia 2, 67100 L'Aquila (tel. and fax 011-39-862-414273).